I’ve written a number of times about Springpad, the immensely useful information capture service. Reading through my notes, I seem to have an on-again, off-again relationship with the service. Over the course of the last few months, and particularly with my move to Mac and the taking up Yojimbo as the repository of the bulk of my note like data, my Springpad usage has declined. But when I hear from the folks at Springpad about changes to the service, I always read with interest. Even as my usage has waned, I really have always been very impressed with the service, and the possibilities of what it could become. The latest batch of changes promise to make Springpad even more useful. ?I’ve already discussed the transition that Springpad seems to be making, moving away from a structured note-taking app toward more everyday usage, like capturing and then using data around restaurants, movies, books, food and recipes, for example. The company’s own description of Springpad as a “lifestyle application” encapsulates this change and is quite apt. So while I don’t really use it to store the notes and other such data as I have in the past, it’s still a wonderful way to grab information about my stuff and then get presented with more contextual information about it. I was really excited to read about the new Extension for Chrome, released today. The nice thing about the extension as opposed to the bookmarklet is that not only does it allow me to get info into the app, it also gives me access to the data that already resides there, without having to visit the site. I can quickly view and sort the info in my account. Adding items is easy and it does a wonderful job of recognizing the type of data that I am adding, and can also enhance it with useful information, such as pricing information or addresses for physical locations. When I clip items using the extension, I can edit the information and add tags. I can’t seem to change the public / private settings at the time of clipping though, which would be nice. I do tend to capture a mix of items and the defaults don’t always match my intentions. Any application that is supposed to help you capture and organize your information is really only as useful as the tools that are made available to help you get that information into the app. No matter what you can do with the data when it’s there, if it isn’t easy to grab and store it, chances are you just aren’t going to take the time. I am not an iPhone (s aapl) or Android (s goog) user so I don’t have access to the mobile applications available for those platforms, but they’ve received a couple of useful updates designed to make that connection even more useful, specifically the ability to send mobile alerts from within Springpad and to quickly push notifications about specific items directly to your phone for easy access. Again, the ubiquity of the data and the ease with which it becomes useful is key. I think mobile users with access to the Springpad application will find the service even more appealing than I do. 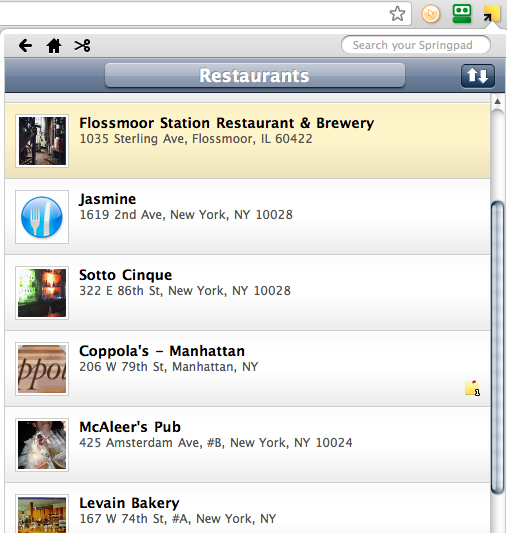 Springpad is free, web-based and works in all major browsers. Applications are also available for iPhone, iPad and Android. I am rediscovering my Springpad — what can it do for you? Springpad is kickass service. love it.